Last Thursday, the 8th of November of 2012, The Concrete & Corrosion Consultancy Practice Ltd hosted a half day CPD Seminar on The Inspection, Diagnostic Testing & Reporting on Buildings and Structures, at the Union Jack Club, Waterloo Conference Centre, London. Nigel Cox, The Concrete & Corrosion Consultancy Practice on The Inspection, Diagnostic Testing & Reporting on Buildings and Structures. Ashley Palmer, Remmers Systems on The Application of Specialist Concrete Repair and Protection Systems + BS EN 1504. Nigel Davison, Concrete Preservation Technologies Ltd on Methods of Cathodic Protection to Reinforced Concrete. 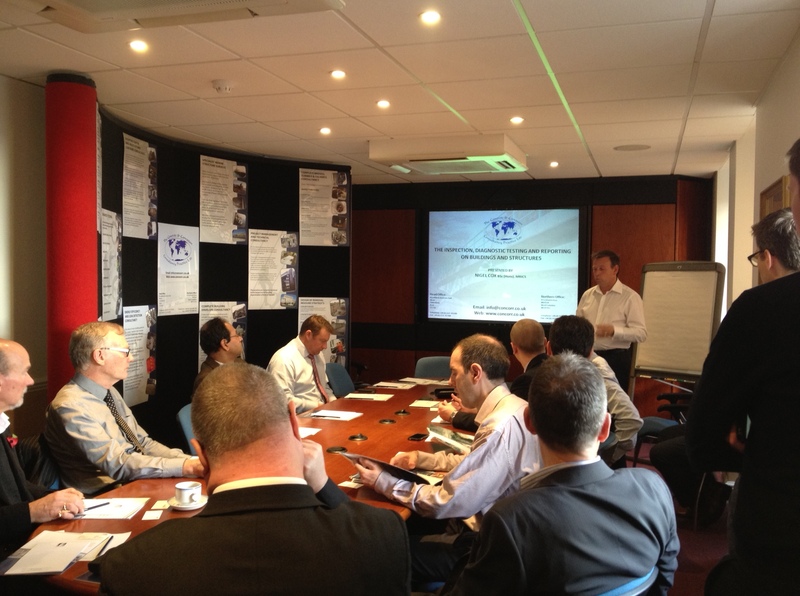 “Thank you firstly to you and the team for hosting the day and allowing our attendance. I think we both found the event most informative and well worth the time away from the office”. “Many thanks for putting together this very useful seminar. I thoroughly enjoyed it. It was really good to meet you all”. At the Concrete & Corrosion Consultancy Practice we had a really good day and we are very looking forward for our next CPD seminars both in-house or in convenient venues around the UK. Following seminars will be hosted in Scotland, Leeds, Manchester and Birmingham. If you would like to get further information or to book your place, please contact us at marina.jmunoz@concorr.co.uk or via telephone at 012 2745 2200. Tomorrow, Thursday the 8th of November, will take place The Concrete & Corrosion Consultancy Practice Ltd first Autumn-Winter 2012/2013 half day CPD seminar at the Union Jack Club, Waterloo Conference Center, London. The Inspection, Diagnostic Testing and Reporting on Buildings & Structures – The Concrete & Corrosion Consultancy Practice Ltd, Nigel Cox. The Application of Specialist Concrete Repair and Protection Systems + BS EN 1504 – Remmers Systems, Ashley Palmer. Methods of Cathodic Protection to Reinforced Concrete – Concrete Preservation Technologies, Nigel Davidson. CPD certificates will be given upon request to the attendees . We are delighted to say that the places are fully booked, however we will be hosting more seminars in Manchester, Birmingham and Leeds during February, March and April. Make sure you do not miss them out. We are very looking forward to seeing all of you tomorrow and very happy to receive interest for future seminars.